​In 2021, the Archdiocese of Cincinnati will be celebrating its’ Bicentennial. In celebration of this event, we will be creating a series of new pilgrimages. ​The planning of these events are at the beginning stage, so please check back for future updates of events. I expect to also make available new celebratory patches, possibly trail medals and hiking staff medallions. Pope Pius VII erected the Diocese of Cincinnati on June 19, AD 1821, in territory taken from the Diocese of Bardstown. On July 19, AD 1850, Pope Pius IX elevated the diocese to an Archdiocese. At this time, there are no scheduled hikes for 2019. All of the maps, directions and information will continue to be available for downloading and the patches and rockers will also continue to be available for purchase. I hope to continue to add Trails and special events for the future. Please check back for additions, updates and special events. As before, you don't need to wait for a special scheduled day for your hike. You can plan and schedule your own. As you begin to plan your hike or hiking schedule for the year, I heartily recommend contacting the parishes you intend on visiting. Many of the Churches are open ALL of the time, but many, unfortunately, are seldom open except for posted times. Calling and scheduling an approximate time of your visit for each Church will allow someone to open the Church for you and sometimes allow you to meet with the Parish Priest who can add a great deal of information about his Church. ​An Alternative Trip - Drive! Last fall, due to a foot injury, I was not able to actually walk the scheduled Hike of the North Trail to the Marie Stein Shrine in the Land of the Cross-Tipped Churches. So my wife and I decided that we would drive instead. We were able to visit over 15 parishes and drive past several more including the former Seminary. We had a delightful morning and afternoon witnessing the faith of the region. Please feel free to use this simple Prayer Guide, which can download HERE one. It has a list of common recommended prayers in both Latin and English. hristians have been traveling to Holy places since the beginning of the Church and have been actively encouraged to go on Pilgrimages since the Middle Ages. The Pilgrimage participants (pilgrims) are on a spiritual journey as well as a physical journey. The Pilgrimage is a time of leaving our daily lives behind, turning to the Lord, repenting of our sins, increased prayer life and in some cases, hope for miraculous cures for ills. 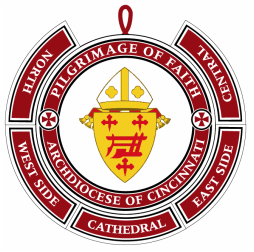 The primary Pilgrimage is centered around the Archdiocese of Cincinnati’s Cathedral, the seat of the Archbishop, heir of the Apostles. The Bishops, in union with the Bishop of Rome (the Pope), are responsible for our spiritual welfare and have established parishes throughout their dioceses for our spiritual needs. Patch can be ordered and worn on a Scout Field Uniform's right pocket. For each hike a rocker or segment can be also ordered and sewn onto the patch. The configuration shown shows all of the trails that can be hiked. “The Catechism of the Catholic Church notes that sacred art is true and beautiful when “its form corresponds to its particular vocation: evoking and glorifying, in faith and adoration, the transcendent mystery of God, the surpassing invisible beauty of truth and love visible in Christ, who ‘reflects the glory of God and bears the very stamp of his nature,’ in whom ‘the whole fullness of deity dwells bodily.’... Genuine sacred art draws man to adoration, to prayer, and to the love of God, Creator and Savior, the Holy One and Sanctifier” (CCC 2502). This Pilgrimage of Faith trails have been developed for the local Scouting organizations but all are encouraged to participate in these hikes in an effort to increase their faith and to help each person on their own walk with the Lord. Depending on the time of day, some of the Churches may be open. All participants are encouraged to pray at each Church, inside if open. Possible prayers could be the “Our Father” and several “Hail Marys” or something similar. While on the Pilgrimage, all pilgrims are encouraged to attend Mass if available, attend the Sacrament of Penance / Reconciliation and make use of sacramentals such as holy water as they enter and leave the Churches. As is the biblical and historical custom, pilgrims are also encouraged to give alms to the Churches they visit. Fasting from food is recommended along the trail but drinking water is highly encouraged. Younger Pilgrims can participate on all Pilgrimage trails but are recommended to limit themselves to 5 miles per hike. For the younger Pilgrims to complete the various 10 mile Pilgrimage trails, each trail can be broken into two separate hikes to fulfill the requirements. The 10 mile Pilgrimage Trails are intended for older Scouts to hike in one setting and will also fulfill requirements for the Hiking Merit Badge. To earn the 20 Mile Hike rocker for the patch, pilgrims can either hike a 20 mile loop, reverse a 10 mile trail back to their starting point or repeat the 10 mile trail on the same day. All Scouts are required to hike the Pilgrimage of Faith Trail wearing the regular field uniform or their “class B” uniform during the summer. Our Scout uniform tell people who we are and what we stand for in a similar manner that the outward signs (clothing) the ordained and consecrated religious wear to remind them and others of their vocations to the Lord. All participants should be respectful of private property along on the Trail and should practice the principles of Leave No Trace. These trails are urban trails some of which goes through a few areas whose residents fail to live by the Scout Law. We recommend that you Be Prepared for these areas and travel with a minimum of two adults and four scouts. The Churches along the Cathedral Trail are old parishes with beautiful interiors and exteriors, rich histories and have served the needs of the faithful for many generations. This document is a collection of information from various sources documenting a small part of these churches from the distant past to the present. It includes a brief description of each parish and when possible a photo or two. The Central Trail covers the locations of the first and oldest Catholic Churches in Dayton in the central portion of the Archdioceses of Cincinnati. Like the Cathedral Trail, many of these parishes are have beautiful interiors. This document is a collection of information from various sources documenting these churches from the distant past to the present. It includes a brief description of each parish and photos. The West Side Trail is an extension of the Cathedral Trail. It follows the movement of the faithful as they moved up and out of the Ohio River valley and began establishing the third and fourth generation of parishes. This document is a collection of information from various sources documenting these churches from the distant past to the present. It includes a brief description of each parish and photos. The North Trail is in the northern portion of the Archdiocese. Due to the large numbers of Catholic Churches in the area it is also called the "Land of the Crossed Tipped Churches".